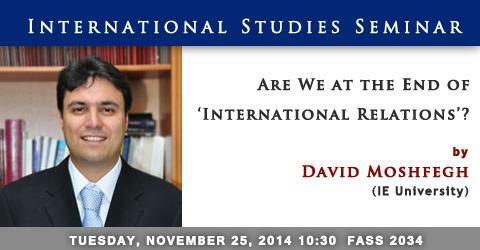 Are We at the End of ‘International Relations’? There is a pervasive cynical view about ‘international relations’: that the relations between states and societies have always simply revolved about money and power. Names and dates have changed, but the more things change, the more they stay the same. I will try in this class to convince you by contrast, that what we call ‘international relations’ reflects in fact fundamental changes in how societies and cultures have understood themselves over the course of human history. My hope then is that you will come away looking at ‘international relations’ as an open subject, for we are ourselves in the midst of radical change and the ground is moving beneath our feet as we talk about it. To begin with, it is important to understand that ‘international relations’, understood literally as relations between nations, is something that is only about two hundred years old. It did not exist before the advent of nationality and the nation-state in modern Europe. The great Ottoman and Safavid Empires that confronted each other in the Middle East five hundred years ago are today often seen in terms of a clash between Turks and Persians, the older version of Turkey facing Iran. But these empires understood and legitimated themselves not in national, but in universal religious terms. The first nation-state came into being after the French Revolution in the European context. But, the nation-state, from the beginning, turned imperial to maintain itself, whether against the Old Regimes of the past or eventually the globalization of the market at the end of the nineteenth century. And, then it spread to the whole world with anti-imperialist decolonization, but ironically in the midst of a Cold War between the super-national ideologies of Capitalism and Communism. Today, the ‘nation-state’ itself is in crisis, with the rise of super-national institutions like the EU or super-national political identities like Islamism. Hence, we ask, are we at the end of ‘International Relations’? David Moshfegh earned his Ph.D. in History from U.C. Berkeley, where his work in European intellectual history focused on the ways the histories of academic disciplines, Orientalism and imperialism have intersected. His dissertation, “Ignaz Goldziher and the rise of Islamwissenschaft as a Science of Religion” places the advent of the ‘Science of Islam’ within the nineteenth century context of Protestant and Jewish reformists who competitively historicized and idealized their respective traditions. He is currently working on a second project, entitled, “From Kulturpolitik to Jihad: The Rise of Islamwissenschaft and German Orientalism in the Era of WWI”, which examines the development of this new Islamicist discipline in German Orientalist scholarship in the closing decades of the nineteenth century and tracks the field through the ‘Jihad debate’ within it during WWI. In conjunction with his work in European history, he has undertaken significant research within the Middle-East field on the trajectory of religious minorities in Islamic history. He has co-authored the sections on Jewish communities in the Islamic context for the third edition of Ira Lapidus, A History of Islamic Societies. Before completing his PhD, he was appointed a visiting instructor in U.C. Davis’s History Department, where he taught a course on the history of Jews in Muslim societies. At IE University, he teaches courses on the History of International Relations to students at both the Bachelors and Masters level and is responsible for teaching Humanities courses to Masters Business students.